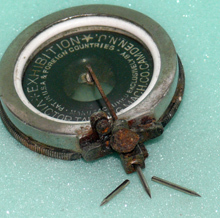 Replacement needles for all brands of record players that use a straight needle in a sound head similar to that shown. Will also work in the old transcription players that used cylindars. Basically, they work in any wind-up phonograph. Portable or otherwise. All Steel needles should be replaced after 2 or 3 plays to protect your cylindars or flat records. Steel needles will wear to a wedge shape quickly and when you see black or grey dust gathering around the needle, that is the music being cut off of your record.